The photogram, which is a unique print, has been used by many innovative photographers over the last century as a means of directly recording the effects of light. 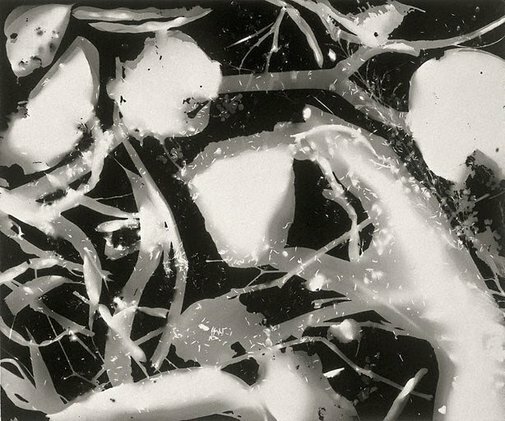 Sue Ford’s photogram dates from the mid 1980s, a period marked by the passing of the artist’s mother, an event which gives the photogram an elegiac quality. There is a pronounced duality with the layers of imagery in ‘Photogram’, as is typical of Ford’s practice, reflecting the interaction between hand and mind, camera and eye. This interaction is obvious with a photogram when one considers the necessary connection between the manipulation of light, the photo-sensitive paper and the artist’s intent. In the context of Ford’s interest in the cycle of life and death, her choice of medium appears potently appropriate. The result of the active meditation involved in the photogram process is the creation of a singular unrepeatable image, a ‘one-off’, making Ford’s image perhaps synonymous for individual life, and the act of creation one of renewal. There is an interesting link between this triptych and Ford’s ‘Time series’ from the 1960s for which she photographed friends over time at designated intervals, their faces increasingly marked by experience and age. While there is a certain poignancy associated with the passing of time and our own mortality – which led the artist to regard the camera as a ‘time machine’ – the photogram can be considered a poetic rendition of the power and mystery of shadow and light. Judy Annear, Photography: Art Gallery of New South Wales Collection , 'Magical realism', pg.226-245, Sydney, 2007, 241 (illus.). Sue Ford , Melbourne, 2014, 134 (illus. ).